Carnival Triumph is to become the Carnival Sunrise. Carnival Cruise Line will budget $200 million for an overhaul of the Carnival Triumph so sweeping that the ship will get a new name, the Carnival Sunrise. It is only the second time that Carnival has renamed a ship of its own design. In 2013, it rechristened the former Carnival Destiny as the Carnival Sunshine. Carnival said the two ships will form the new Sunshine class. The $200 million sum is the largest ever spent by a cruise line in a ship renovation. By the time the work begins next March, the Triumph will be 20 years old. It is perhaps best known for an engine-room fire in 2013 that left it disabled off the coast of Mexico without power for most hotel services. The ship had to be towed back to the United States, on a four-day odyssey that was memorialized as “the poop cruise” because toilets didn’t work for most of the trip. In the two-month renovation, to be done at the Navantia shipyard in Cadiz, Spain, a laundry list of Fun Ship 2.0 features will be added to the ship, including seven restaurants, two bars, two lounges, three new pool deck attractions, a newly designed spa, two new children’s play areas and new retail spaces, including a candy store. Gus Antocha, Carnival’s chief operating officer, said the additions complement certain upgrades that had already been made to the Triumph, such as Guy’s Burger Joint. Unique to the Sunrise will be what Antocha called “bridge wing suites,” encompassing two junior suites and two larger Captain’s Suites adjacent to the bridge, which will be redesigned with floor-to-ceiling windows. That means the ship’s capacity, listed as 2,758 passengers at double occupancy, will remain relatively unchanged. “We’re adding a handful of different spaces,” Antocha said. When the Carnival Sunshine was created, an extra 182 cabins were added to the Carnival Destiny. The first sailing of the Carnival Sunrise, following a renaming ceremony, will be from Norfolk, Va., where the ship will begin a series of five- to seven-day cruises on April 29, 2019. It will then move to New York for the summer for a series of four- to 14-day cruises, starting May 23. It will move to Fort Lauderdale for four- and five-day cruises in October. On the Sky Princess, the Sky Suites will be centrally located on the top decks and feature the largest private balconies ever offered by Princess Cruises. Princess Cruises unveiled renderings of areas of the Sky Princess, a ship due in October 2019, including suites with the largest balconies ever offered on Princess. The 700 square foot verandas will give suite guests a private vantage of the ship’s Movie Under the Stars screen. Two of the suites will have 270-degree panoramic views and have a sleeping capacity for five guests. Sky Princess guests will enjoy two deep-tank top deck pools and more Jacuzzis than previous Royal class ships. New for Sky Princess will be the addition of a Wakeview pool on its aft decks. In addition to the Wakeview pool, Sky Princess will have two deep-tank top-deck pools, a restorative Retreat Pool, and more Jacuzzis than previous Royal class ships including two Jacuzzis cantilevered over the deep-tank pools. The ship’s Vista Lounge will get a new look complete with a full bar offering, an evolution of the popular lounge on other Princess ships. Guests can take advantage of a new cafe in the Princess Live venue, serving barista-made coffee, tea and quick bites. Norwegian Bliss in Southampton, photo credit Dave R Jones. Norwegian Cruise Line said it is getting rid of single-use plastic straws on its 26 ships. The ban also applies to its two private islands, Great Stirrup Cay and Harvest Caye. With the changes, Norwegian said it expects to eliminate over 50 million plastic straws from use annually. In announcing the ban, Norwegian did not specify when the ban would be implemented or what it would use as a substitute for plastic straws. Various cruise lines have announced initiatives to reduce or eliminate single-use plastics onboard as a contribution to marine conservation. 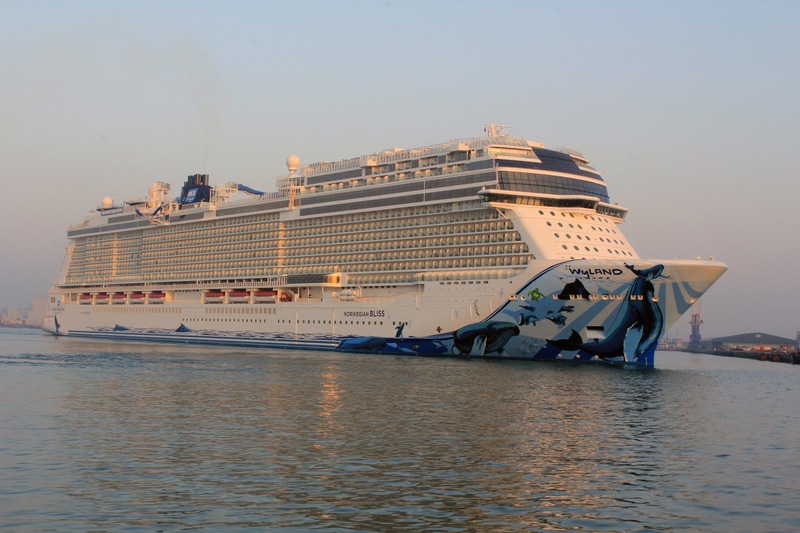 Norwegian initiated its plastics-reduction approach by banning plastic straws in the inauguration of its latest ship, the Norwegian Bliss.